My work is stocked in several shops throughout the South West. Please contact me if you would like to find a stockist local to you, or are an independent shop interested in selling my work. I enjoy exhibiting to the public at Art Trails around Bristol, and advertise when these are forthcoming on my Facebook page. 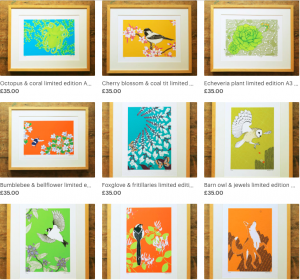 You can also buy a broad range of my cards, prints and gifts from me directly, via my online Etsy shop.